Many of the big fashion brands have unique social media sites, but in my opinion one brand has got it spot on when it comes to a site which you can sucked into every single day - that is Burberry's Art Of The Trench. Soon I will be uploading this one in the hope that it gets chosen by the Burberry AOTT team! 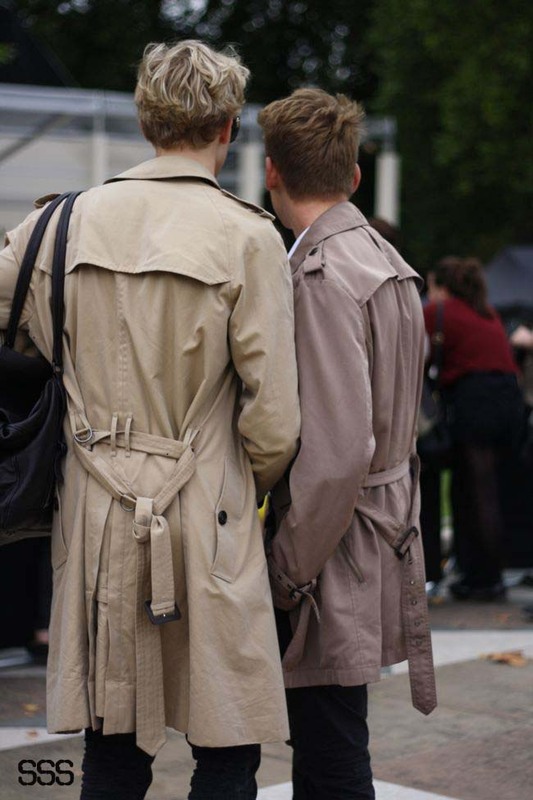 I snapped these boys both wearing their Burberry Trenches at the Prorsum show this year. I loved the way they had both styled them to perfection, seriously how could I not Style Stalk them! Fingers crossed it gets chosen, if so, this will be my third picture on the site - excited face!! I'll be sure to let you know if it does!! Couple of sites which I strongly recommend for a spot of weekend reading.. one being of course Art Of The Trench and the other being Rufflr, which is a new online store that I'm dangerously addicted to at the moment. You can even find wear to buy the outfit that these lovely lads are wearing!! I just adore a good Burberry trench, they're so perfect. They look so cool!!! I love burberry trench one day i will own one! This is such a good picture and they look so cool in their matching trench coats.